It’s fall here on the Palouse, for sure. Cold, damp, muddy–but with occasional bursts of brilliant sunshine, some amazing last-ditch blooming and fruiting. We’re being initiated into the world of athletic participation: Little Sunshine has joined the junior high cross-country team. After 43 years of avoiding even the most ancillary whisker of an athletic event, I’ve had to get with the program. There’s a lot to learn–and other parents are way ahead of me. I’m still figuring out what to bring to a meet (hint: my coat, some gloves, a hat, hot coffee, a chair, and several afghans), and how to budget my time (hint: cross off the whole day, and add knitting to the list of items to bring). I’m sure by the time Tuxedo Boy is clocking his three miles, I’ll have the whole thing down pat. To celebrate the successful meet (nephew Steam Boy and niece Amaryllis, as well as Little Sunshine, were all competing), I made my own version of the beautiful cake on the cover of Country Living, which is L.S.’s new favorite magazine. Although they tried to dress it up, it’s really a good old-fashioned Silhouette Cake, such as you’d find in any 1920s cookbook. So instead of their chocolate-pumpkin spice cake (which just sounds nasty), I used my tried and true King Arthur Devil’s Food, with plain old butter cream frosting, and then ran the chocolate ganache from the magazine over the top. What do you think? It is very pretty, I just got my magazine today and I was thinking about having this at my bunco party in a couple of weeks. My question is how did it taste? Was it delicious? It’s either make this or cook a couple of pies. I have the magazine of this cake on my blog. Do you want me to link you to it? It will only take a minute and people that check out my blog might come see your cake. It was good, although I thought the chocolate over the frosting was maybe a little bit much. 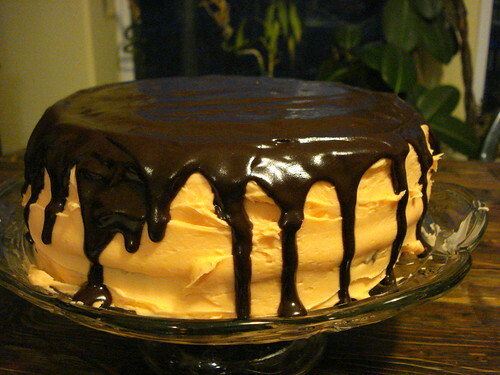 If I were doing it again, I’d add another layer of my cake–remember, I didn’t make the pumpkin chocolate cake, because no-one in my family could get behind the idea of messing up good chocolate with pumpkin–, flavor the frosting with orange oil, and use a thin chocolate glaze rather than the thick ganache (which, by the way, is how the original Silhouette Cake was made). Hey, Jean! Thanks for stopping by!